Lately, I’ve been seeing more players on wearing gloves on the pickleball court. As I’ve mentioned on the blog before, I grew up playing racquetball from an early age with my dad. A glove is a pretty standard piece of equipment in racquetball and I still always wear one when I play. But interestingly, if you look at other racket sports like tennis- no one wears gloves! After comparing the gloves currently on the market: my top pick for the best pickleball glove is the HEAD AirFlow Tour Glove. Scroll down to see my full review and other top picks, or jump down to see a more stylish option for women’s pickleball gloves. The Pickleball-X Performance Glove By Franklin Sports is one of the first gloves on the market that was specifically designed for pickleball and as a sponsor of the 2017 Minto US OPEN was presented as the “Official Glove of the US Open Pickleball Championships”. Regardless of the title of official glove, Franklin is leader​ in the sports glove market and well known sports equipment manufacturer …most notably batting gloves for baseball. If you watch any Major League Baseball, you’ll see a lot of pro players sporting Franklin batting gloves. So you may be asking: What does baseball have to do with finding a pickleball glove? Well, batting gloves actually do have a lot in common since they are used to increase grip on the bat (like the paddle handle), absorb sweat and prevent hand fatigue. Basically those are the same features we are looking for in a pickleball glove. The Pickleball-X glove is made with sheepskin leather palms. Unlike some cheaper models with thin leather palms, these feel solid and seem durable. The leather palms are made with Pittards gripster technology. Pittards is a glove manufacturer that was established in Somerset, England in 1826 (that’s not a typo), they know gloves! Unlike most leathers that get more slippery as hands sweat, the gripster technology is used to improve the grip as the leather gets wet with sweat, softening and expanding the surface area to increase grip. 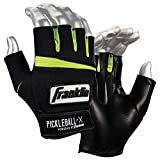 I’m surprised Frankin decided to sell them as a pair since pickleball players would really only wear the glove on their paddle hand. I just see the thing ending up at the bottom of my pickleball bag. These are new gloves on the market that were launched not that long ago so I’m hoping that Franklin comes out with an option to buy just one glove (right or left) individually. Apart from the Pickleball-X gloves there are very few other gloves designed specifically for pickleball. There are some others, such as the “Advantage Pickleball Glove”, that also has the open finger design. However, after looking at it I didn’t think the quality was worthy to make this short list of recommendations. So, for other options, we look to racquetball gloves. They provide the same features that we are looking for: a glove with a cushioned palm to improve our grip, absorb sweat and relieve hand fatigue. Companies like Head, Wilson and ProKennex have been making quality tennis and racquetball equipment for decades and all of them sell quality racquetball gloves. Although there are women’s gloves in other sports like golf, I have yet to see a pickleball glove for women. 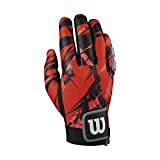 Personally I think the most important feature is the quality of the glove’s leather and the ventilation on the glove backing so I would pick a Cabretta leather glove with a high quality mesh backing like the ones reviewed above but I do understand that style is an important factor for a lot of people, especially when it comes to pickleball apparel and accessories. I get it, just like not everyone wants to wear plain white pickleball shoes, the black and white gloves we reviewed above may be ​a little lacking in the style category for many women. If you’re looking for a more colorful gloves, GloveIt makes some very pretty ladies gloves. They have over 20 very original and unique designs. Although the gloves were originally designed for golf, these could easily work as a good women’s pickleball glove since they have the same features we are looking for in a good glove: they are made of high quality, soft Cabretta leather palm and feature stretch knit lycra backing making them both comfortable and breathable. They are sized for a woman’s hand and sold individually for right or left hand. As an added bonus the glove material provides UPF 50 sun protection which I think makes them a top pick as one of the best pickleball gloves for women. If you’ve read my blog before you probably know I’m always nagging people about using proper UV protection and wearing a quality pair of sunglasses when playing pickleball outdoors! The Head AirFlow Tour Glove features a Cabretta (sheepskin) leather palm. As I mentioned above, this is the most supple and plush leather used in sports gloves. It has that natural feel I associate with leather and the gloves will stay soft longer than other, cheaper leathers. ​The glove backing is made of Nylon mesh Lycra which also creates maximum air flow from the back side of the glove. Because of all these design features, and the materials used, the “AirFlow” really does live up to it’s name and would be a good choice for anyone looking to avoid sweaty palms. The Wilson Clutch Racquetball Glove features “Sticky Skin Technology”, which is done using silicone strips across the synthetic palm material. The silicone gives a tacky feel to the glove palm and helps improve your grip. The Wilson Clutch is made with microfiber suede leather, which is a synthetic “faux” leather. Although it’s not real leather, it gives the feel of leather but you can tell the difference between this and a more expensive sheepskin leather. One advantage is that because it is leather-free, it is machine washable. For me the one thing about Wilson gloves is they come with “dive padding”. Serious racquetball players dive for shots which not only can cause a lot of wear and tear on gloves…it can hurt! The dive padding is on the outside of the pinky finger on the back/side of the glove. This feature is pretty useless on a pickleball glove (unless maybe you are a super aggressive player that is planning to dive for shots? (indoors I could see maybe). The padding doesn’t really bother me, since it doesn’t affect the comfort of the glove, it’s just a feature that doesn’t really come into play in pickleball. The ProKennex Pure 1 Racquetball Glove is made of Pittard’s quartz Cabretta leather which gives it a high-end plush feel. Due to the quality of the leather, the glove also stays softer longer even after many uses and getting wet. Cheaper quality gloves get hard and uncomfortable after the get wet whereas the Pure 1 (made of quality sheepskin) stays supple even after getting wet. Why Wear a Pickleball Glove? Ok, sorry -it might sound like a gross question…but it just a fact that some people sweat more than others and it’s important to think about when buying a glove. If you notice that your hands easily sweat then it’s important to pick a breathable glove with maximum ​absorption. There are also a couple of new pickleball gloves on the market, including the Pickleball-X Performance Glove, that have open fingers (half finger is covered but finger tips are open). These are a good option if you sweat more since the open fingers increase airflow and keep hands drier. One of the most important things to consider when buying a sports glove is the quality of the leather used on the palm and the backing material used (back of the hand). Softness last longer than other leathers. Added synthetic texture gives great grip on the pickleball paddle. Advantage: Breatheable, better airflow, less sweat. Used for pickleball for two months playing twice a week. Washed every time after playing. Material would make your hand black, your clothes black and the water you washed the glove in black. Material finally just failed causing the hole a large hole. I have photos but cannot post. I have not had any pair of gloves fail so badly. In my opinion the glove should be taken off the market. Love pickleball. I did like the open finger and tightening wrist strap features. Look at the Amazon reviews! Thanks for taking the time to leave a detailed comment on our site. 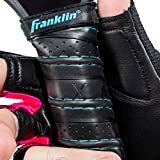 I did test out the Franklin gloves when they first hit the market for a few games while testing them out to do the reviews but didn’t wear them over a long period enough to know how they would hold up over time. (I generally don’t wear a glove when I play pickleball). As you mention, since then some other buyers have left similar negative comments on Amazon.So, I appreciate the detail you’ve offered which will help our readers. You may want to reach out to Franklin, I know on their site they have a form to fill out for warranty disputes and have a option to upload photos. Thanks again for the useful comment.